Home again....thankfully. I love being with my family and at home in the house where I grew up (at least since 5th grade), but it sure is nice to come back to my home now....this lovely apartment that is all mine. To come home to my mess, my routine (or lack thereof), my schedule, etc. And to come home with a few days of vacation remaining before returning to work. My to-do list is long, but is slowly being checked off. New Year's Eve.....how I really hate this day. Somehow it gives me a feeling of things that I'm missing, rather than the promise of things to come. I've only had one or two years where the party that I attended really was worth attending. For years and years I babysat while other people attended their parties. That too was somewhat of a letdown - although the extra cash was nice. This year, I was all set and ready to just have a party of one here in my little home. Then while I was driving home to Dallas on Wednesday, I got a call from my friend Kelly. She, too, was feeling rather ambivalent towards the parties that were on her option list. So, she decided to have people over to her house, where she could sorta "set the tone" of the evening. So, rather than staying at home tonight, I will venture out to her place and ring in the new year there. Depending on how early the party breaks up after midnight, I might spend the night at her house, or might head back home. Whatever you all do this evening, be safe! I've really enjoyed being home for Christmas. Mom & Daddy were in Dallas to just hang out and relax the week before and we caravaned (is that really a word?) home to Abilene on Christmas eve. Heather & Phillip were at his family's house for the holiday, so the three of us just relaxed on Christmas day after we slept in and mom made a yummy breakfast of biscuits and gravy. One of my favorites!! So, our Christmas really came on Sunday after church. It was different this year having Phillip with us. I am just still adjusting to the changing face of our family as we welcome Phillip. It is a good adjustment, though. Today we spent just running around, helping Heather track down some wedding things. Plus, I met my friend Lela for lunch. She is living in South Korea as part of a church planting team. I'm hoping to maybe get to visit her and my friend Rebecca in Chiang Mai, Thailand when I take another trip to visit Sarah in the Philippines -- maybe in late 2005 or early 2006. Tonight is our family dinner with my mom's extended family. We are not eating turkey and all the trimmings this time, and I'm glad about that. Turkey is fine, but not one of my favorites. So, cracker crumb chicken, mac-n-cheese, strawberry-pretzel salad, homemade rolls....yummmm. Then more relaxing tomorrow, and the drive back to big-D on Wed. Read a blog today about going into "hibernation" and look forward to doing some of it the rest of the week, before returning to work next Tuesday. Gotta love long, holiday vacations. ....well, sort of. Today it is cold and moist here in Dallas. Started off this morning with rain, then it became sleet and then SNOW!! Not that it will stick, of course. As a matter of fact, I think it is pretty much gone already! When I went out for lunch today, I got to enjoy the icy snow and blustery north wind. Almost made it feel like Christmas - as opposed to the 70 degrees we had on Monday. I love it!! For any of you who have snow that actually sticks to the ground, please make a snow-angel for me!! Yesterday I reached a milestone.....10 gallons of blood donations! In about 10 years. Pretty amazing, when you think about it. My dad got to come with me for my platelet donation yesterday to see how Carter Blood Care does it as compared with Meek Blood Center in Abilene. It was fun to have him come with. Work this week is interesting -- only a handful of people are here, but there is still plenty of work to do. So while things are more laid back than normal (jeans days!! ), it's not quite like we are on vacation yet. BUT, only 2 more days!! Back home safe and sound from a quick trip over the weekend to Lubbock, TX for my friend Erin's wedding. It was beautiful -- as expected! 4 days and counting until Christmas vacation!! Well, I've mentioned to you before my Annual Christmas Open House, but I don't think I've fully explained all that goes into this event. Let me start with a little history. When we moved to Abilene, I was in 5th grade. My dad started working at ACU (still does actually, though his job has evolved throughout the past 18 years). He had quite a few people under his leadership throughout that time, so mom & daddy would host an Open House each year for his employees/spouses. My sister and I were allowed to attend the "no-kids" party only if we helped --- take coats, encourage people to sign the guest book, refill food on the table, etc. Until I moved to Dallas in 1999, I had never missed one of these parties. Christmas 1999 and 2000 were pretty transitional because I was still really getting settled. Christmas 2001, I was singing on the Worship Team at church, so I decided to have "the party" for the Worship Team. Sad attendance (only 5 people came! ), but I do still have 2 people from that group that wait in eager anticipation for the invitation in the mail each year and wouldn't miss it for the world. Christmas 2003 - 50% increase -- 29 people came! Christmas 2004 - I beat any other year -- 30!! It is a come-and-go party from 6:30-9:00 -- and the time between 7:15 and 8:30 is typically the most popular for people to come. I live in about 900 square feet, but my apartment is arranged fairly well, so it isn't completely overwhelming when all those people are there at the same time! To me, one of the greatest things, is that it is an intergenerational gathering -- I invite my friends, of course, but also several of my elders at church, and this year was the first that a couple of families with kids came. I just love having friendships across all spectrums and being able to share my home with them all. Amazingly, there is always food left over! Which is good, because playing hostess keep me busy and I really don't eat that much during the actual party - I just graze from time to time. And this is all food that I love, so having some leftover is nice (makes for easy lunches!). Anyway, just thought I'd share a little of my holiday experience with you all. Happy Friday!! p.s. I have to thank my two good friends, Kelly & Jenny. Kelly came a little early to help me do the last minute candle-lighting, etc. Jenny stayed a little late to help me put away leftovers. Without those two great friends it would have been a much more hectic and stressful night. Thanks girls - love you!! Yes, it has been way too long since I posted. I know. For the few of you out there that look to see what I might say, I'm sorry. What can I say? My life is out of control. After surviving the Home Tour on Dec 5th, I made a marathon trip this past Saturday to San Antonio down and back in the same day for a wedding. 10 hours in the car for a 3 hour party. Worth it? Yep -- seeing the groom struggle to breathe and not cry like a fool at the sight of his bride....absolutely priceless. Annual Christmas Open House .... at my house ..... tomorrow night! I love it. Really, I do. It is lots of fun..... but lots of work. Looking forward to the clock striking 6:30 pm and hearing the doorbell chime as the first guests arrive. Then I can breathe and enjoy the night. Another wedding this weekend -- not quite so quick a trip, but still will only be about 36 hours. Fly to Lubbock Sat morning, wedding Sat evening, church and fly home Sun evening. My parents are coming in on Sun afternoon to enjoy a week to relax at my casita. Will be very nice -- but it means all the Christmas gifts must be completed and wrapped before I head to Lubbock. Think they are all purchased, just have some wrapping to do. Oh, yeah, plus work. This week has been Board Meeting week - which somehow has equated to crazy week this month. Maybe it is because we are presenting the 2005 budget, I don't know. Plus, about the last of my good friends at work is quitting. My three other favorites (outside of my department) have left to pursue other options in the past 18 months, now Ovi is leaving too. I'm pretty bummed. All that to say - I'm going to have a serious, sit down, come-to-Jesus meetin' with myself over the Christmas holiday time away from work and set some clear boundaries and priorities as far as what things I will be committing to next year. This is just way too much. I need to be able to enjoy my life, not just run from one thing to the next. And I'm only doing it for one right now - imagine if I had kids! Well, the Home Tour is officially over and was definitely a success. We sold a lot of tickets (around 900) and processed a ton of transactions through the Holiday Shoppe. Final receipts are still coming in as we continue to receive ticket packages back from the reps that sold tickets for us and as our advertisers from the program send in their checks, but it has proven to be a record-breaking year! Better than any other in the past. While it was a great success, it was physically exhausting. I spent about 28 hours from Friday evening through Sunday evening on getting the Holiday Shoppe set up and then the actual tour on Sunday. Then spent about 4 hours today working on getting numbers finalized, deposits processed, etc. And that is just a little part of the hundreds of hours that were spent by all the volunteers in preparation of items to sell. All for a great cause. This Sunday, December 5 is the Home Tour that I have spoken about previously for New Friends New Life. Finally it is here. I haven't had nearly the overwhelming workload (especially in the last few days) that some have in regards to this event, but I sure will be glad when it is over. So, from about 4:00 today until probably 8:00 Sunday evening, all I will do is eat, breathe and sleep Holiday Shoppe business! Sunday, I will go to early church after taking a friend to the airport at 6:00 am (more on that in a minute), then head over to the Holiday Shoppe about 10:30 for final last minute preparations. Then from 1:00-5:00 it will be complete crazy busyness as we check-out everyone who purchases items from the Shoppe. Then comes my real work: the cash counting, totalling, and the hold-your-breath moment of "how much did we make this year?!?" Crazy. Nuts. Insanity some would say. But also immensely satisfying to use my talents and abilities to aid this wonderful ministry. So, if you think about it, say a little prayer for low stress levels, high tolerance, and NO RAIN! So, to the airport run at 6:00 am.....my best friend from college, Sarah, moved to Manila (that is in the Philippines) in July 2003 to teach children of missionaries at Faith Academy. I went to visit her in October 2003 and it was a very unique experience. 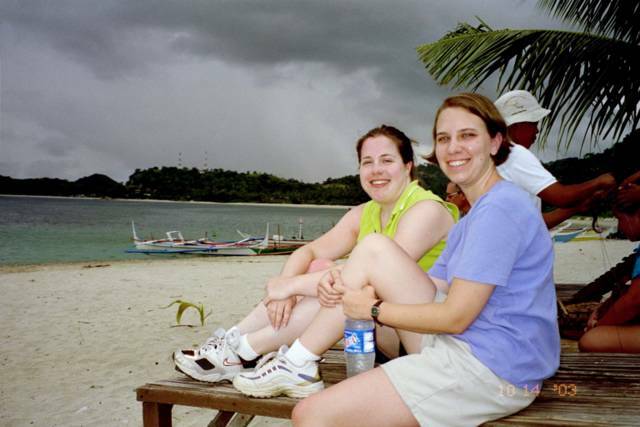 Here's a picture of us on the beach at Puerto Galera (on another island in the Philippines). Anyway, Sarah came home spur of the moment last week to attend her grandfather's funeral and she'll be spending the night with me tomorrow night and I'll be off to take her to the airport on Sunday morning - bright and early! Well, I guess I probably should get back to work now....Happy Friday everyone! !